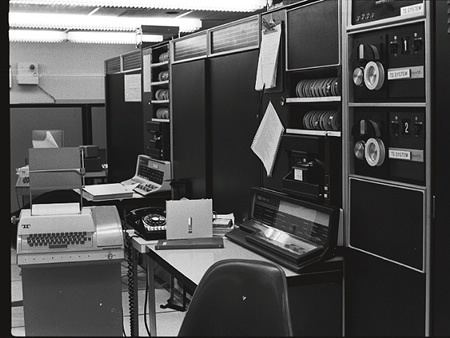 The first network email (there were many earlier instances of email within a single machine) was sent through the ARPANET by Ray Tomlinson in late 1971 (November - December). The first email was written in all upper case (shouted) and the content was insignificant and forgettable. It was sent between two computers side by side (see picture below). The "@" symbol was used by grocers and accountants throughout the English-speaking world to indicate a rate, or cost per unit, as in "10 gal @ $3.95/gal" [ten gallons at three dollars and ninety-five cents per gallon]. Ray Tomlinson used the at sign to indicate that the user was "at" some other host rather than being local.